Easily share any of the charts below by clicking on the social media buttons directly below them. 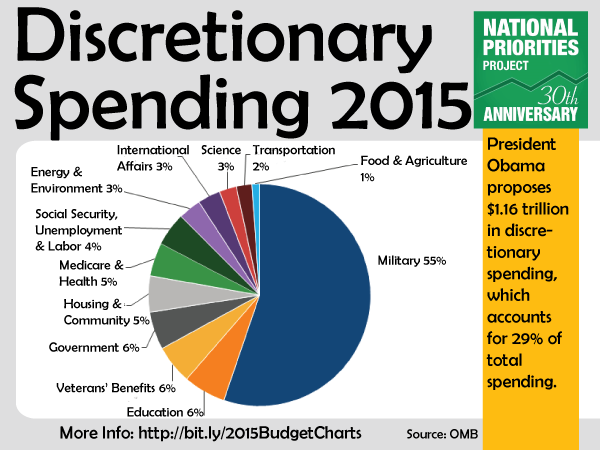 President Obama recently released his 2015 budget proposal. And budgets are about priorities: What we’re going to spend money on, and how we’re going to raise the money that we’re spending. 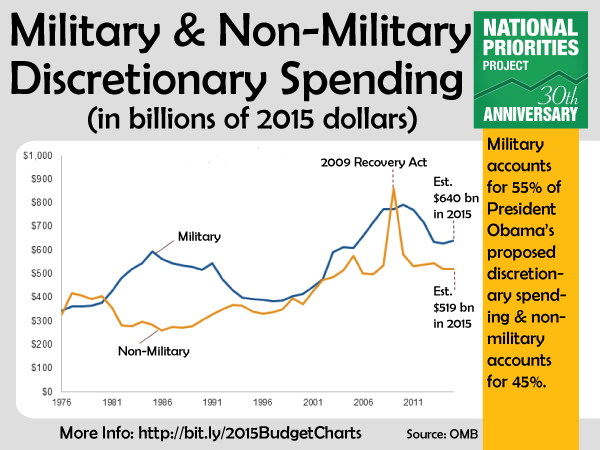 These pictures tell the story of the priorities in the president’s budget. 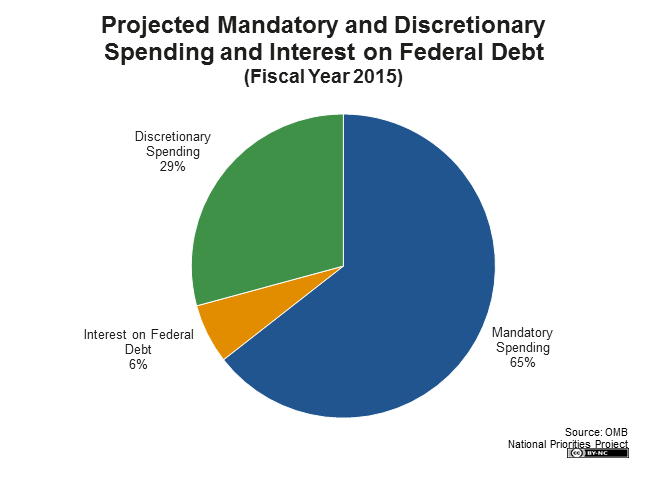 This chart shows how President Obama plans to spend $2.6 trillion in mandatory spending in fiscal year 2015. 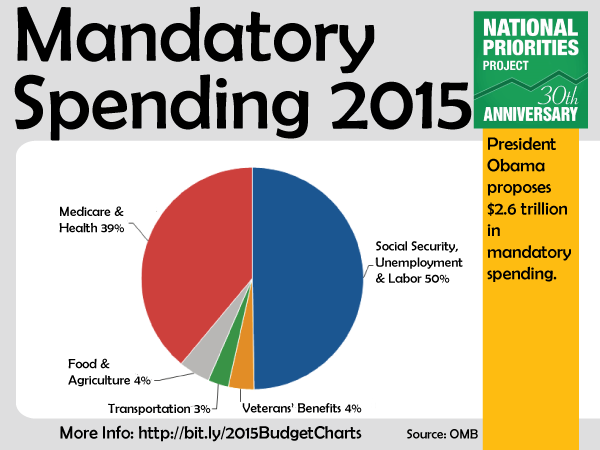 Mandatory spending includes programs like Social Security and Medicare, which are often called earned-benefit programs. Lawmakers do not choose the exact amount of money spent on these programs, because it depends on how many people qualify for benefits. 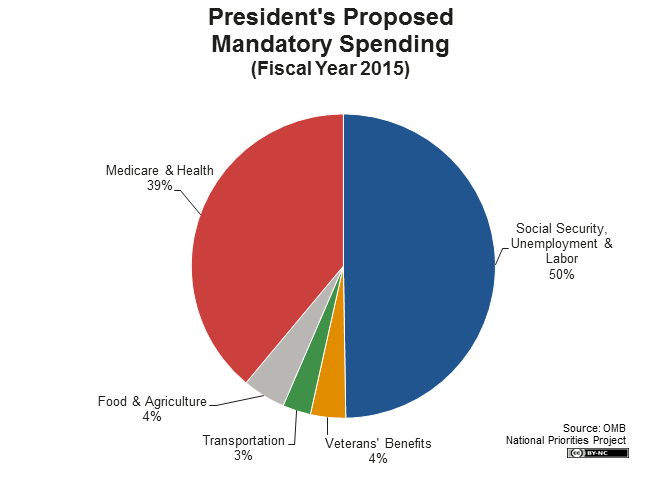 Note: While there is some mandatory spending that occurs in categories beyond the five that are shown in this chart, they are so small that together they account for less than 1 percent of the total and have been omitted. 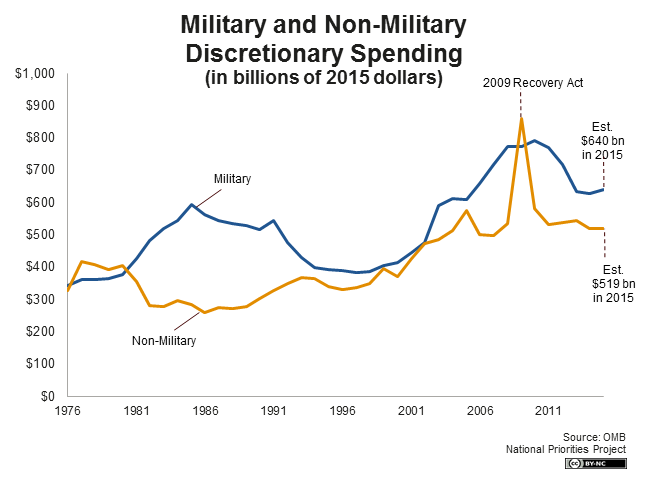 This chart shows how funding for military and non-military discretionary spending has changed over time. 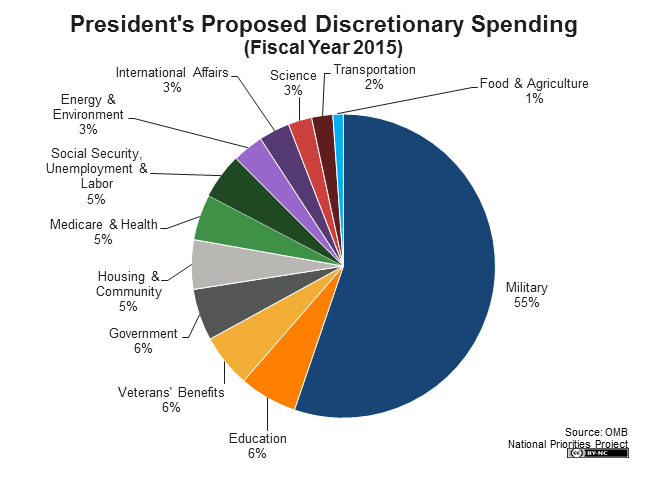 Military spending accounts for 55 percent of the president’s 2015 discretionary budget proposal, while non-military spending accounts for 45 percent. 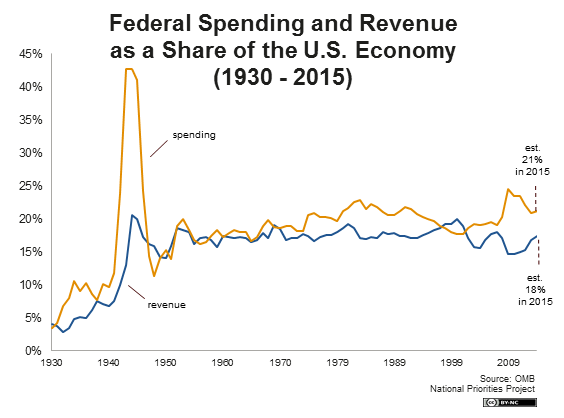 This chart shows federal spending and tax revenue as a share of the overall U.S. economy all the way back to 1930. 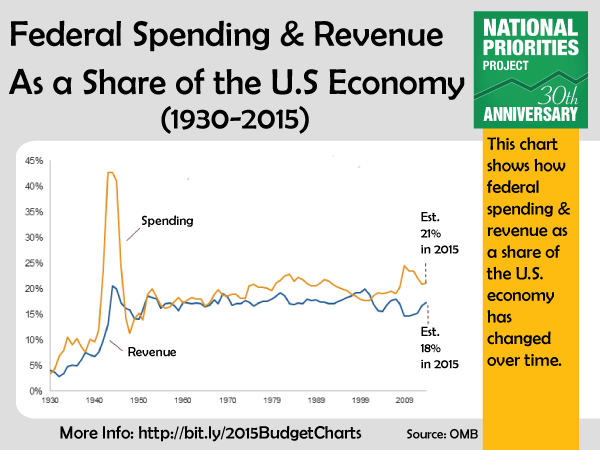 In 2015, President Obama proposes federal spending levels totaling 21 percent of the U.S. economy and tax revenue equal to 18 percent. 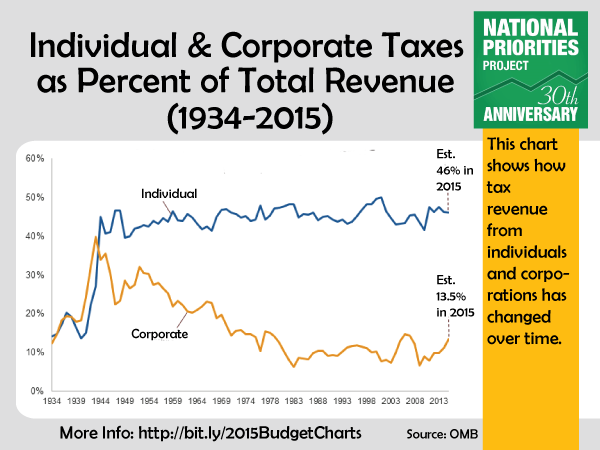 This chart shows how tax revenue from individuals and corporations has changed over time. 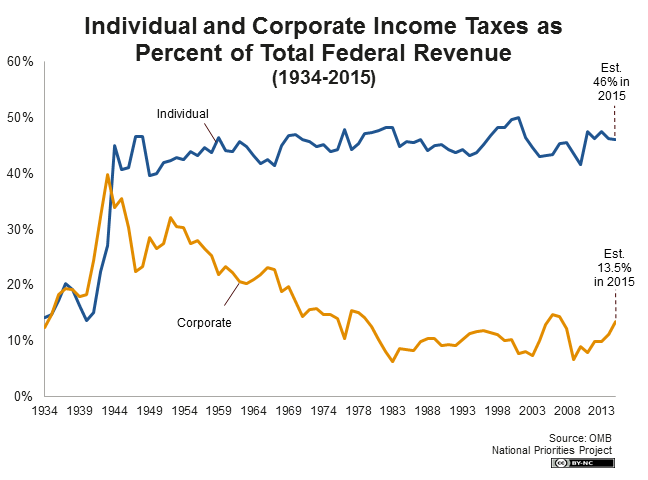 Individual income taxes will account for 46 percent of total tax revenue in 2015, while corporations will contribute 13.5 percent. Other federal revenue will come from payroll taxes, as well as customs and excise taxes. 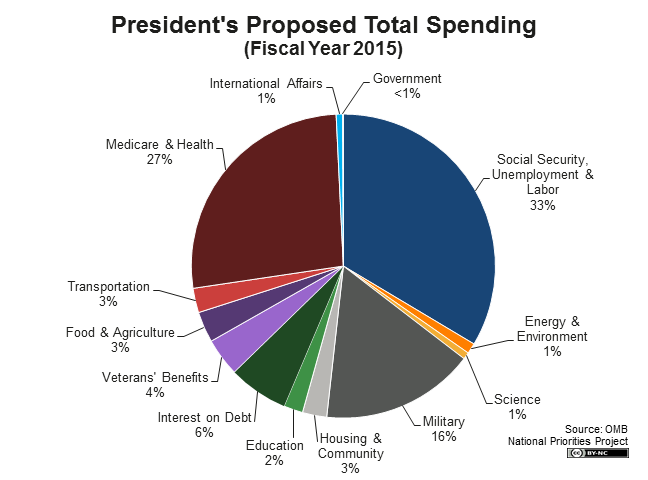 President Obama proposes collecting $3.34 trillion in total tax revenue in fiscal year 2015, with individual income taxes and payroll taxes – which fund Social Security and Medicare – as the largest revenue sources. 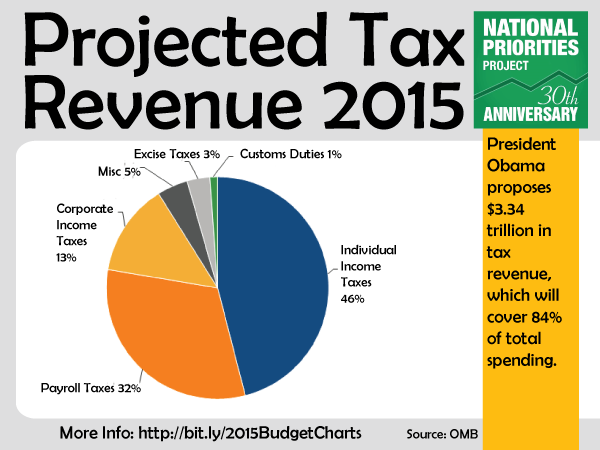 Tax revenue will cover 84 percent of total spending. The rest – 16 percent – will come from borrowing. 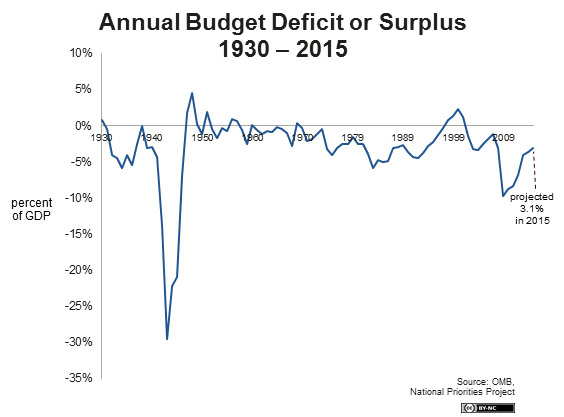 This chart shows the size of the federal budget deficit (or surplus) as a share of the overall U.S. economy since 1930. 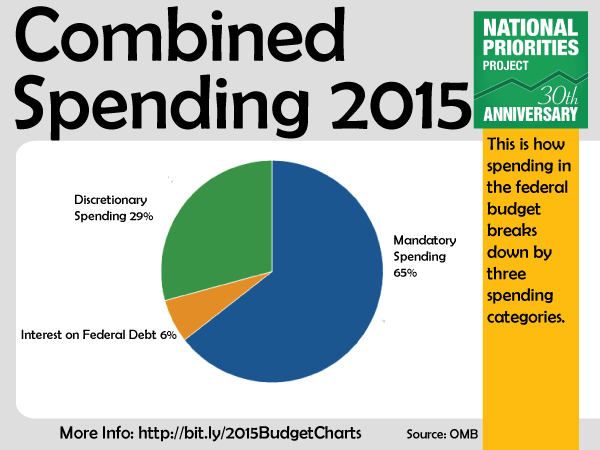 In President Obama’s 2015 budget, the deficit amounts to 3.1 percent of the economy. 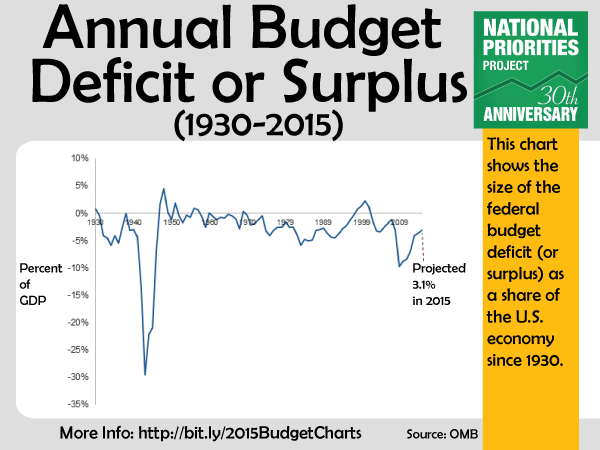 As you can see, that’s roughly on par with annual deficits since World War II. 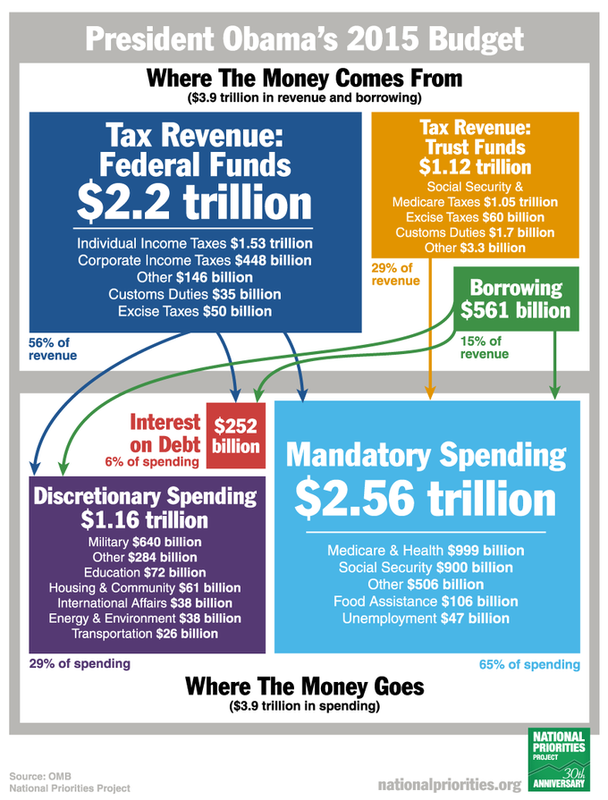 This graphic shows how the government brings in revenue - from different types of taxes as well as borrowing - and how it spends money on programs ranging from Medicare to education to the military to interest on the federal debt. 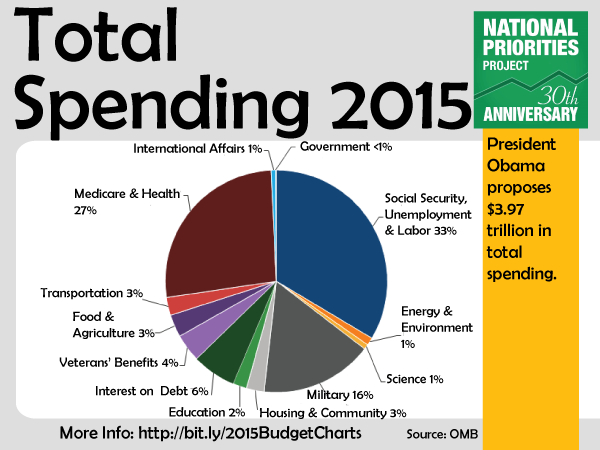 For additional analysis of the President’s fiscal 2015 budget, see NPP’s President Obama Proposes 2015 Budget.